Southern Berkshire County is a magical place. Some call it paradise. When glaciers from the most recent ice age began their last retreat, abundant plant and animal life returned to the Housatonic valley. Mastodons and wooly mammoths roamed the turf, and human visitors known as Paleo-Indians followed their prey here. The southern Berkshire area was first inhabited by the Native Americans of the Algonquin nation. For unknown reasons, the ancient aboriginal settlements were abandoned, but later the Housatonic valley and surrounding hills became part-time hunting grounds for Mohican Indians who drifted over from their Hudson River settlements. When Dutch and English settlers arrived here prior to 1730, the local Native Americans lived in two small villages along the Housatonic River. According to tradition, one of the sites in what is now Great Barrington was referred to as the “Great Wigwam.” Another village was located in what is now Sheffield. Although many of the early white settlers in south Berkshire were of English extraction from the middle and eastern parts of Massachusetts, as well as from Connecticut and Rhode Island, there were also many Dutch families who had settled here even earlier from adjacent areas of New York. Great Barrington was known as the Upper or North Parish of Sheffield until 1761, when it was incorporated and named the Shire town of the new county of Berkshire. The towns of Pittsfield and Great Barrington were created by an act of the Great and General Court of Massachusetts in 1761, the former named for Britain’s Prime Minister, William Pitt, and (most likely) the latter for his war minister, Lord Barrington. Following the Boston Tea Party in 1773, the English parliament took over the Massachusetts colony and assigned judges and magistrates to replace the democratically elected local governments. On August 16, 1774, hundreds of Berkshire County residents, supported by scores of supporters from nearby Connecticut, occupied the courthouse in Great Barrington and prevented the British-appointed judges from sitting. It was the first organized resistance to British judicial rule in America! An important trial that led to the abolition of slavery in Massachusetts also occurred in the same Great Barrington courthouse. In 1781, Mum Bett aka Elizabeth Freeman was a slave in the Sheffield household of Colonel John Ashley. After overhearing Ashley and his colleagues discussing human rights, Mum Bett was determined to win her own freedom. The brave woman approached lawyer Theodore Sedgwick who agreed to help her. The case was heard at the Great Barrington courthouse during the summer of 1781. Sedgwick argued that slavery was unconstitutional under the Massachusetts constitution which declared that all men are free. Mum Bett won her case and, after similar cases were upheld by the Massachusetts Supreme Court, slavery was outlawed in the state. In the early 1800s, the southern Berkshires remained primarily a quiet farming community. But by the time the railroad arrived in 1842, business was booming! Over one hundred years ago, Irish, Polish and Italian immigrants came to work in the factories and on the railroads. The rich and famous came to build their vacation “cottages.” Tycoons and tailors, laborers and lawyers, factory workers and farmers: all called the southern Berkshires home. And all the while, the tourists came. They still do. Over the years, many former visitors have adopted the Berkshires as their new home. The special synergy that exists here between people and place has inspired remarkable residents for centuries. 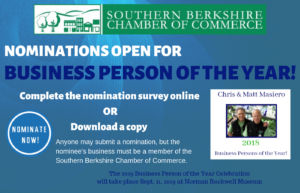 No doubt the talented business leaders that make up the Southern Berkshire Chamber of Commerce are all history makers! Local historian Gary Leveille is a writer, editor, educator and photographer who resides in the Southern Berkshires. He has written numerous books including the popular Legendary Locals of the Southern Berkshires and Old Route 7: Along the Berkshire Highway.